Hardwood flooring is one of the most popular floor surface covering materials ​and has been for centuries. This is due to its versatility of function and design, as well as an inherent natural charm that gives each installation a unique personality and beauty. Softwood Flooring: This includes materials harvested from a variety of trees, most commonly Pine, Fir, and Cedar. These species tend to mature very quickly and are readily abundant. However, their rapid growth leads to the wood itself being less dense and therefore less durable. This can make it susceptible to dents and scratches. It also makes it harder to refinish, as low spots can rapidly be created by sanding machines. Despite these drawbacks, many people still choose to either expose or preserve softwood flooring surfaces in their home, due to the beauty and unique characteristics of the material. The material is also more eco-friendly because it can be locally sourced and is rapidly renewable. Hardwood Flooring: The trees that hardwood materials are harvested from grow much slower, and end up being far denser, and more durable than softwood counterparts. This means that they last longer and require less maintenance. The actual durability of species will vary and is rated by the National Oak Flooring Manufacturers Association (NOMFA) using the Wood Hardness Rating scale. 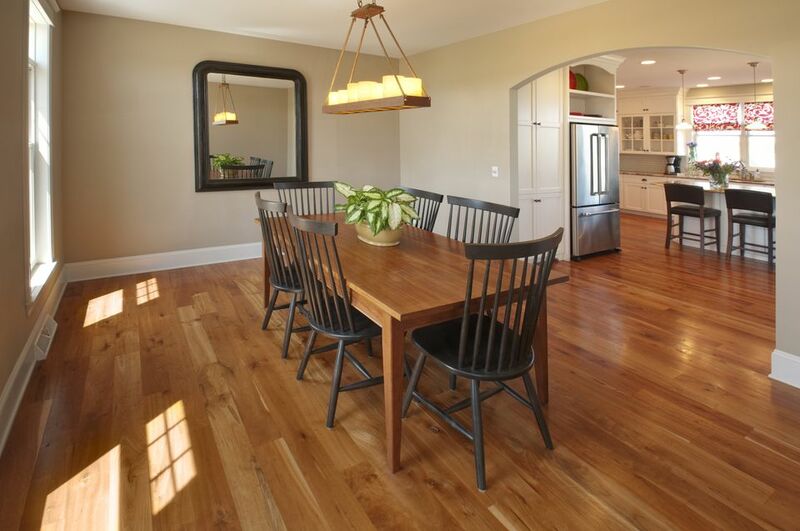 One of the great things about hardwood flooring is that it never goes out of style. It’s been in use continuously for thousands of years, and despite numerous shifts and changes in style and design, it has survived the test of trends, showing that the look of this material never gets old. This is largely due to the fact that hardwood is an instant connection between an interior location and the natural world. The feeling of a forest, the essence of a densely thicketed wood, all can be achieved in even the most modern mundane environments. Unique: Every plank, board, or strip used on a hardwood floor is a unique work of natural art, with its own individual patterns, and colors. This is compounded by the fact that there are dozens of different species of domestic, imported, common, and exotic hardwoods to choose from, each with their own particular grain, color, and characteristics. That ensures that each installation of this material is a one-of-a-kind feature. Character: Over time wood is going to change. It will acquire subtle shadings of color, and pick up small scratches, nicks, and dents, which will collect on the surface to create a unique personality for your floor. That is the kind of character that cannot be bought but can only be attained over the course of years. Large Spaces: Wood is a particularly good flooring material for large open spaces. That is because the grains and patterns found within its surface will help to break up the monotony of the room, acting as a backdrop, while also working to infuse interest and design into the space. This effect will be compounded by the use of plank, parquet, and small piece decorative hardwood installations. As you can see, the price for different species of hardwood flooring can vary significantly. However, as always, you are going to get what you pay for. Reputable companies, selling quality, long lasting materials are going to charge more. Further, harder woods tend to take longer to grow, making them more scarce and more expensive. While the initial investment for some of the more durable hardwood floors can be significant, you have to balance this against the fact that these materials will tend to last much longer than other flooring options. Even the softest woods will outlast carpet and cork, while a solid, well-maintained oak floor can last for generations. At the low end of the price range, you can purchase softwoods such as pine or cedar for even less than a dollar a square foot. Manufactured plywood sheets are going to be your least expensive option. While these may not be the richest or most high-end materials, when well treated and maintained they can provide a space with a rustic beauty. Heat: Hardwood is a moderately warm flooring material that maintains a relatively even temperature at all times of the year. Warmer than natural stone, but not as snug as carpet, hardwood is compatible with underfloor radiant heating systems, which allows you to keep them toasty even in the winter. This is also an efficient way to contribute to the warmth of the entire room. Soft: Wood floors usually have a moderate amount of give underfoot. This is especially true when they are installed on joists, or over some sort of insulating underlayment. However, you should avoid installing it directly on concrete, as this can lead to it being very rigid, and uncomfortable. Noise: This can be one of the biggest drawbacks when it comes to hardwood flooring. Not only will you occasionally get problems with squeaks in the floorboards, but unpadded hardwood can also be very loud when heard by neighbors or family members who live down below. However, installing a cork or foam underlayment can help to solve these issues.